What is Trinity Care Adult Day Care? Trinity Care Adult Day Care is a professional care setting in which older adults receive individualized therapeutic, social, and health services during the day when family members or caregivers have other commitments like jobs, school or other obligations. Our Adult Day Care Center provides a coordinated program of professional and compassionate services for adults in a community-based group setting. Services are designed to provide social and health related services to adults who need supervised care in a safe place outside the home during the day. Care in our facility is often an alternative to nursing home care, thereby allowing seniors to continue to live at home while providing respite care for the caregiving adult child or spouse. Our center operates during normal business hours five days a week Monday-Friday. What can Adult Day Care do for your family? Adult day services provide a reliable source of support, offers balance in times of crisis, and enhances overall quality of life for caregivers. For caregivers, we simplify and coordinate your loved ones care so you can spend time being with your aging loved one instead of feeling stressed and overwhelmed trying to manage their health needs. For them, we handle the difficult issues by providing personalized care at a cost that is significantly less than other care options such as assisted living or nursing home care. 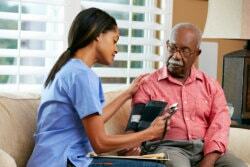 Does Adult Day Care provide Skilled Health Care for participants? At Trinity Care an Adult Day Care Center in Morrow, Georgia, we have a full range of interdisciplinary professionals who meet the physical, emotional, and social needs of participants and family caregivers. Because Care is provided and coordinated by specially trained staff, we can handle your loved one’s complex health related needs. Family caregivers will have peace of mind knowing your aging parent or senior loved one is spending the day in a safe, fun and socially engaging environment while receiving compassionate care. There is an increase in disease-specific programs offered in centers to address chronic conditions. More than ever, adult day care participants have higher levels of chronic conditions and disease, such as hypertension (46%), physical disability (42%), cardiovascular disease (34%), diabetes (31%), mental illness (25%), and developmental disability (20%). There is a heightened focus on prevention and health maintenance — with nearly 80% of adult day care centers offering physical activity programs to address cardiovascular disease and diabetes. At Trinity Care, we focus on improving the overall health and well being of every participant in order to prolong independence while supporting caregivers and families. Our services are uniquely designed to meet the needs of every individual based on their strengths and weaknesses. For more information, please contact us, to develop a customized plan of care based on your loved one’s medical condition.